Lexa was voted NYC's Best Witch by The Village Voice! The NY Times says: "Ms. Roséan has her share of satisfied customers..."
and The New York Post hails Lexa as the "psychic of the moment"! and that she writes predictions for Cosmo and Seventeen magazines as well as the Reportango! but she offers our tango community a once a month gift of tarot/astrology readings for $15! 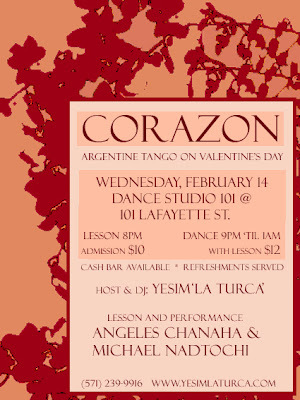 Come enjoy an unforgettable night of tango at Corazon, the Valentine's Day milonga. At 8pm, Angeles Chanaha and Michael Nadtochi will teach a lesson on musicality, connection, and floor navigation that will help both beginners and advanced dancers to share the floor all night. At 9pm, the dance floor opens and the milonga begins. La Turca will be DJing until 1 o'clock, so bring your dancing shoes! Light refreshments will be served, and there is a cash bar available with alcoholic and non-alcoholic drinks when you need to recover from a tanda of milongas. Renowned milonguera and psychic Lexa Roséan will bestow special Love Spells upon guests for luck in love in the coming year. Singles and couples are both welcome to ask for a blessing. Later in the evening, enjoy an amazing performance by Angeles and Michael. Dance Studio 101 is located on the 2nd floor of 101 Lafayette Street. We're steps away from the N, W, R, Q, 6, J, M, Z, A, C, and E trains at the Canal Street stop. The spacious Art Deco venue is a perfect setting for a night out dancing. Go to Buenos Aires with Gayatri! Ready for a warm embrace in Buenos Aires? A unique, intimate tour where PARTNERS are guaranteed for both the days of CLASSES and the nights of dancing at the best MILONGAS. Airfares are changing daily so come on board now!! * Inspiring spectacular dinner show. I may be able to help with airline reservations, time is of the essence. For great airfare deals contact Baneza now! with the amazing Gayatri Martin! 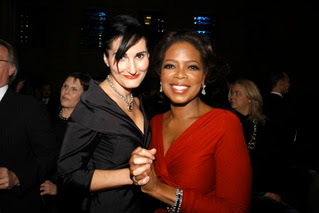 Atoosa and Oprah sure look like they're dancing tango! I'll miss Big Momma as my editor at CosmoGirl! & Seventeen but Atoosa's changed partners so let's keep an eye out for her exciting new dance! ps: I know some of you will be dancing up a storm on Prom Night, so don't forget to read my astrological predictions for the big night in CG! Prom Winter/Spring 2007 At Newstands NOW! *Guests are Carlos and Tova Moreno from Boston. They will be performing and teaching a class entitled "Snappy changes of direction"
*Performances by Adam and Ciko, Just back from an extended stay in BsAs. *Also Ladies! We will have a large selection of Comme Il Faut shoes on sale courtesy of Carrie Whipple from Portland Oregon who is coming all the way to sell shoes at Nocturne. **We will also have Lexa Rosean reading charts and tarot from 10pm - 3am! Take out 15 minutes to see Lexa at Nocturne Milonga to dance with your Stars and see what 2007 has in store for you! $10 Admission includes A Very Beginner's class at 6:30 in front bar area w/Lucille. Same time,6:30 --More Advanced lesson in back party room w/special guest teacher, Lexa Rosean!! Come for a delicious order of tapas and receive A FREE DRINK!!! Momento propicio para hacer lo que se deseaba. "Propitious or favorable moment to do what was desired"